The effect of two different multiple autoclave cycles on surface of topography of rotary nickel-titanium(Ni-Ti) files by atomic force microscopy HU Kun-e,LI Yun-sheng,TAN Rong,HU Dong-mei,LI Jing-ru.Meitan General Hospital,Beijing 100028,China. Effects of the traditional chinese drug dipsacus asperoides on the orthodontic tooth movement and the alveolar bone density in rats WANG Yuan1,WANG Xu-xia2、3,JIA Yu-long1,YAN Shu-yun1,ZHANG Jun1、3.1.Department of Orthodontics,School of Stomatology,Shandong University,Shandong Jinan 250012,China;2.Department of Oral and Maxillofacial Surgery,School of Stomatology,Shandong University,Shandong Jinan 250012,China;3.Shandong Provincial Key Laboratory of Oral Biomedicine,Shandong Jinan 250012,China. The effect factors of animal modeling of pulpal revascularization in immature dog permanent teeth WEN Chun-mei,HUANG Yang,CHEN Wen-xia,ZHANG Ying-juan,ZHONG Xiao-yi,LI Kang-jing.Department of Operative and Endodontics,College and Hospital of Stomatology,Guangxi Medical University,Guangxi Nanning 530021,China. [Abstact] Objective:The purpose of this study was to investigate the effect factors in the animal modeling of pulpal revascularization in immature dog permanent teeth.Method:Total 36 incompletely-developed roots of maxillary anterior teeth or mandibular premolars from 3 hybrid dogs were selected to build up the animal model of pulpal revascularization on the basis of previous periapical periodontitis model.Result:3 roots had no blood coagulation clot and 4 roots had inferior MTA filling at the apexes.7 roots developed periodontitis,5 roots had crown fracture and 1 root lost accidently during the period of observation.Conclusion:The quality of blood clot and MTA filling technique,and the presence of periodontitis and pain could effect the model building-up of pulpal revascularization. A study on the three-dimensional reconstruction and measurement of craniofacial skeleton based on cephalograms HOU Yu-xia1,ZHOU Hong1,PAN Jun-jun2,ZHANG Yan-ning2.1.Orthodontic Department of Stomatological Hospital,Xi'an Jiaotong University,Sahnxi Xi'an 710004,China;2.Computer Department of Northwestern Polytechnical University,Shanxi Xi'an 710068,China. 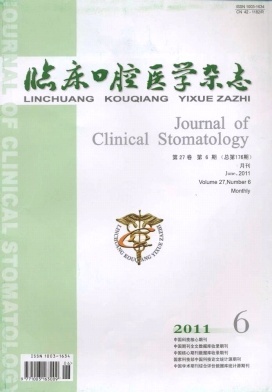 Expression of PKC-α and BCL-2 and relationship between them in ameloblastoma XIAO Yun-he,GANG Wei-dong,XIONG Gui-zhong.Department of Stomatology,The 5 th Hospital of Wuhan,Hubei Wuhan 430050,China. Expression of VEGF and NOS in Salivary adenoid cystic carcinoma and its relation to angiogenesis and clinical pathology LI Xiao-guang1,YU Xiao-peng1,LIU Ping1,WANG Yan-xiu2.1.Department of Stomatology,Taian City Central Hospital,Shandong Taian 271000,China;2.Department of Anesthesiology,Taian city central Hospital,Shandong Taian 271000,China. The expression and clinical significance of cyclooxygenase-2 and vascular endothelial growth factor-C in oral squamous cell carcinoma HUANG Yuan-qing1,SONG Yu-feng2,YI Jian-guo1.1.Teaching and Research Department of Stomatology,the HuaiHua Medical College,Hunan Huaihua 418000,China;2.Department of Oral and Maxillofacial Surgery,the Affiliated Hospital of Guiyang Medical College,Guizhou Guiyang 550004,China. Expression of Id1 and its correlation with tumor angiogenesis in salivary adenoid cystic carcinoma LI Yuan,LIU Yuan,ZHOU Jun,DONG Shao-zhong,JIN Yan.Department of Oral Pathology,School of Stomatology,Fourth Military Medical university,Shaanxi Xi'an 710032,China. Effect of N-acetylcysteine on biocopatibility of dentin adhesives DU Shan-shan,ZHOU Juan,XIE Long-chuan,CAI Hong-bo,LUO Zhi-xiao.Department of Stomatology,Affiliated Taihe Hospital of Hubei University of Medicine,Hubei Shiyan 442000,China. Clinical application of nitrous oxide/oxygen inhalation sedation in pediatric dentistry JIANG Qiu,YANG Xiu-ling.Department of Pedodontics,Stomatology Hospital of Jilin University,Jilin Changchun 130021,China. Mechanical effects of a pit and fissure sealant incorporating a quaternary ammonium monomer LI Feng1,CHEN Ji-hua2,WU Dan2,LI Fang2,GAO Jing2,FANG Ming2.1.Department of General Dentistry;2.Department of Prosthodontics,School of Stomatology,The Fourth Military Medical University,Shanxi Xi'an 710032,China. Comparative the effciency of three kinds of removable appliance with posterior bite plate and lingual spring applying on correcting deciduous anterior crossbite HE Ai-e,GANG Wei-dong,XIONG Gui-zhong.Department of Stomatology,The Fifth Hospital of Wuhan,Hubei Wuhan 430050,China. Model analysis of extraction and non-extraction crowding cases treated with Damon Ⅲ appliance HE Wen-dan,LIU Ying-zhi,CHEN Dong,FU Yu.Department of Stomatology,the 4th People's Hospital Futian of Shenzhen.Guangdong Shenzhen 518033,China. Clinical observation on dental implant surgery with flapless technique in posterior area SUN Zhen-yu,LIU Hui,WANG Dao-fu,CHEN Guang,ZHANG Ming-rui,FENG Jie.Department of Stomatology,No.305 Hospital of PLA,Beijing 100017,China. Clinical study on impacted upper anterior teeth by orthodontic treatment CHEN Xiao-ming1,2,TANG Zhan-gui1,LIU You-liang2,QUAN Hong-zhi1,ZHAO Li-li1,ZENG Bi-ying2.1.Xiangya Hospital·School of Stomatology,Central South University.Hunan Changsha 410008,China;2.School of Stomatology Yiyang Medical College,Hunan Yiyang 413001,China. Treatment effects of reverse-headgear in correction of severe skeletal anterior cross-bite in mixed dentition GAO Xiao-li,WANG Chun-ling,XIAO Li-li,HU Ming-yan,WANG Hai-ren,REN Da-peng.Department of Orthodontic,Stomaology Hospital of Shandong University,Shandong Jinan 250012,China.